From the creative minds of two artists emerges the huggable plush Little Ugly Jrumpy doll. 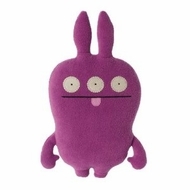 The award-winning Uglydoll plush characters are available in three sizes and a wide variety of styles, each with its own distinct personality. Their hand-sewn faces insure that none of them look exactly alike. Part superhero, part stuffed animal, these dolls appeal to both boys and girls, young and old alike. Uglydoll characters inspire creativity while reminding us that we are all unique. Winner of 2006 Parent's Choice and Toy of the Year awards. Pretty ugly.